I dont really know what to say .. Its just that u get so overwhelmed after watching the movie, that u feel like sharing it with everybody. 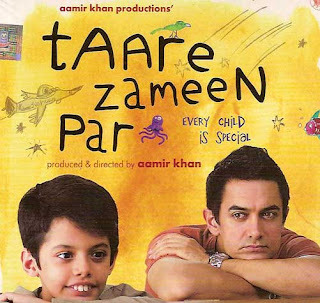 There are emotional movies, there are heart wrenchers.. and then there is Taare Zameen Par..
Aamir , The Master Craftsman has delivered a flawless masterpiece with the sweet and innocent Darsheel stealing your heart. Its not just about the one particular case that Aamir has brought to light, but the very essence of present day parenting that he questions. Parents today, are after their kids' lives to study hard, get good grades, perform outstandingly, and if nothing more, then atleast outshine the child living next door. The tagline of the movie says "Every Child is special", oh yes they surely are.. cant people understand the simple fact that not every child is meant to do very well academically, there may be other things that one could be good at. The fact of the matter is that there are other things that one is good at, only that these talents are overlooked by the parents and peers, and eventually whatever little creativity lies in an individual dies a premature death. One has to thank Aamir for choosing an issue which is close to every child's heart, and somewhere or the other,in some manner or the other, each one of us has gone through the same feelings , wanting to break free.. As a friend of mine suggested, the way Rang De Basanti brought about changes in the mindset of many a people, and actually made them come out of their comfy homes and fight for various causes, it would be simply fabulous to witness anything on similar lines through the platform of Taare.. Sooner or later, we have to realize that life is not a 100 m dash for all of us, for some it can also be a marathon, a big long marathon where things go steady.. All in all, no matter how parents have come to understand the nittygritties of life, it is too soon to impose it all on small young kids.. On an ending note, here are few lines from the Title Song that capture the very essence of the movie. Kho na jaayee yehh.. Taare Zameen par..